The SLK is getting a new name, updated engines and interior tweaks for 2016, as Mercedes-Benz expands its renaming strategy to include its compact roadster. Pricing is still to be confirmed, but the new Mercedes-Benz SLC will be available to order from mid-January, with the first cars reaching showrooms in April 2016. 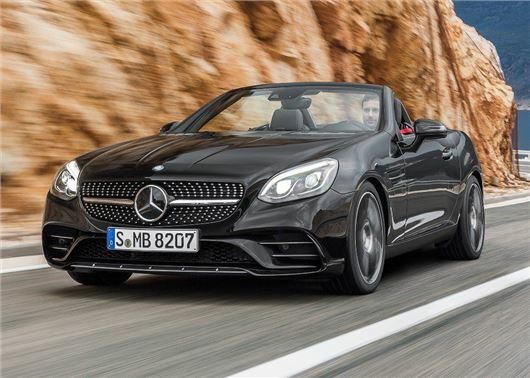 Mercedes-Benz has already renamed its entire SUV range in 2015 and now the SLK name will be axed in favour of the new SLC brand - with the C acknowledging the model's close relationship with the C-Class, from which much of the roadster’s technology is sourced. As well as new name badges, the SLC gets updated styling, more efficient engines and improved levels of standard equipment. The styling tweaks include new bumpers, larger air intakes and a diamond radiator frille that brings the SLC design in line with the larger and more expensive SL. All SLC's gets LED daytime running lights and tail lights, while the folding metal roof can be fitted with panoramic glass and selectable brightness control. Inside the SLC gets contoured sports seats with improved lateral support and sun-reflecting leather upholstery. The dashboard is almost identical to the old SLK, although the SLC does get a new sports steering wheel and updated infotainment system with a larger seven-inch colour display and updated navigation software, which should provide quicker routing and directions. The powertrains start with the 2.0-litre petrol with 184PS or 246PS. The SLC 200 - with 184PS - is the only model to get a six-speed manual transmission, while the SLC 300 - with 184PS - and 250d with 204PS are matched to a new nine-speed automatic. The SLC 250 d is the most efficient model in the range, with an official 64.2mpg and 114g/km of CO2. The entry-level SLC 200 will return a claimed 46.4mpg and 127g/km, while the SLC 300 will provide up to 48.7mpg. Dynamic select is fitted as standard across the range, allowing the driver to tailor the suspension and throttle response with the choice of four driving modes - comfort, sport, sport+ and eco. The range-topping AMG SLC 43 is powered by a new 3.0-litre V6 biturbo and is capable of covering 0-62mph in 4.7 seconds. As well as the extra power, the AMG gets larger brakes, 18-inch alloy wheels and sports suspension. Official fuel economy is 36.2mpg; a slight improvement over the V8-powered AMG SLK 55's 33.6mpg. Standard safety kit is also better, with all SLCs getting active brake assist, which will automatically apply the brakes if the system detects a low-speed collision. Automatic LED headlights and blind spot assist will also be available as payable options.